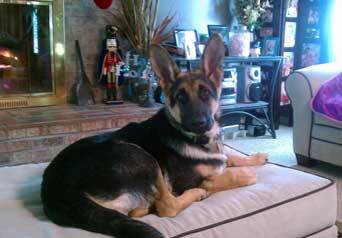 This is Diesel, a 7 month old gsd. He loves to be with his family and is great with my 5 year old daughter. Diesel was added to our family due to losing our 6 year old gsd to cancer. She was a great dog and will be missed greatly. Hey there, Darryl. It is good to hear from you all the way up in Indiana. Thanks so much for taking the time to come here and sharing your German Shepherd puppy story with us all today. I Love the picture - he looks soooooo comfortable just hanging out there on his bed! What a handsome big boy you have there. He is definitely a keeper. And absolutely gorgeous! It's good to hear he is doing so well with your 5 year old daughter - I imagine they'll be best friends before it is all over. German Shepherds can be really good with children, especially when they are raised with them, and since she is just a "pup" herself I imagine they have a lot of fun together. Just make sure you supervise them well when they are together since he will get big pretty fast and might accidentally hurt her without meaning to when he gets bigger. I don't know about your boy but mine is still very clumsy and he is a year old.